This tour is for certified tour divers looking for an adventure on the Island of Oahu. You will be taken to two different locations on this wreck and reef dive. The day starts with a 7:15am pickup in Waikiki from your centrally located hotel. Then your group will head back to the dive shop. There you will get fitted with equipment and head out to one of the two boats. Either out of Kewalo Basin aboard the Snoopy V, where you can see the Sea Tiger or YO-257 to start or you head out to Hawaii Kai to see the Corsair or Baby Barge! This is all considered to be some of the best wreck diving in Hawaii! 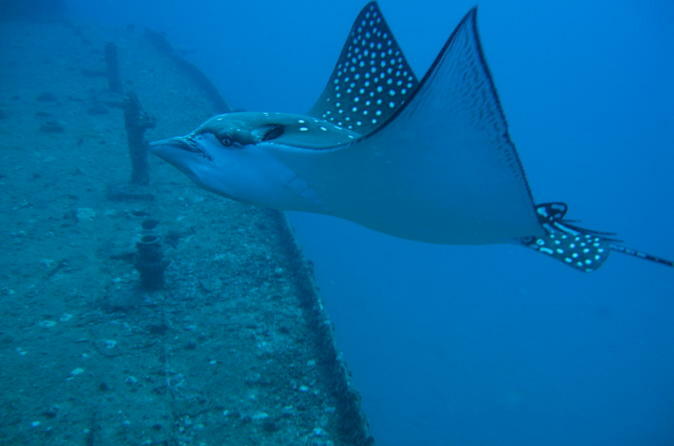 You will follow these dives with shallow reef dives or drift dives along Portlock Wall. one these dives it is common to see turtles, eels, octopus, spotted eagle rays and many other forms of sea life. Everyday is adventure, come join for a day or two.